South Africa is arguably ahead of other major countries focussed on mining in terms of bringing women into the mining workforce. Even so, women in the industry face mammoth challenges, from a lack of suitable physical facilities and protective clothing, to outright sexual harassment. "All over the world, mining is a male-dominated industry and I think South Africa is leading in terms of developing women in mining. That said, it's a tough place to be, whether you are in the public or private sector. You always have to prove that you are 10 times better than your male counterparts," says Debbie Ntombela, director at law firm Hogan Lovells and a mining law specialist with over 17 years' experience. This includes five years as a lawyer in the private sector and 12 years with the Department of Mineral Resources, where Ntombela in 1997 became one of the first two female regulatory managers in the department's history. "We had a lot of training and that was a good thing; I knew very little about the mining industry," she says. "I had applied and landed at the right place at the right time. They wanted to transform the department and were looking for women." She was keenly aware of the scepticism with which many men viewed women in mining. "Even now, it is a huge challenge. In many instances men have not really accepted that women can work in mines." Aspects of the physical reality of mining, especially in mining operations, continue to be unwelcoming for women. "The physical conditions women work under are often inappropriate," says Ntombela. "You still find ablution facilities that both genders are expected to use, creating circumstances that are ripe for harassment." She believes it could take another 10 years before women are truly accepted as part and parcel of the industry, especially underground. "That is a pity because women are hard workers. We are loyal, diligent and hardworking and if there were more women in the industry, I believe we wouldn't have all these strikes. The first thing we think of is, I have a child and I need my salary." 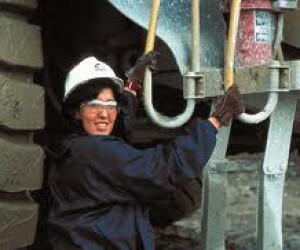 Despite the many challenges that women face in mining, the industry does have its attractions. "What are they? Success," says Ntombela. "I work with big mining clients and have a lot of respect for them, and they for me." Her colleague, Associate Thokozani Dlongolo, also with Hogan Lovells, says mining is a fascinating industry that can benefit greatly from the skills and involvement of women. "For me as a young black woman, mining is part of the development of our country. It touches our history and encapsulates virtually all of South Africa's most pressing political and economic issues, from unemployment and poverty through labour law, to land reform and conservation through environmental law, to inequality and economic freedom through commercial law as well as criminal law. This is a great time to get into mining and be part of the process of change." Dlongolo, who has practiced in mining law for two years, says mining and mining law may seem, to some, a daunting career choice from the outside. "It looks like an intimidating industry because it can be very technical. I was fortunate to have encountered some absolutely phenomenal women who trained me and took the time to explain the procedures. I have also learnt a lot from our clients. In fact, my experience is that people in the industry are very willing to explain and help you understand." This does not mean that the traditional barriers confronting women in mining have tumbled, Dlongolo says. "The hurdles for women working in the business or commercial sector of mining and for women working underground can be substantial. 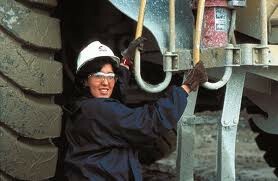 The issue of Personal Protective Equipment specifically designed for women is still an issue, specifically for women underground. However, sexual harassment, in various forms, can be a very real problem, for both women working underground and women in the boardrooms. "Sometimes when I go to a mining company, I do feel in the minority as a woman. At times, I feel I have to prove I know what I am talking about before I am listened to. There are at times question marks about the knowledge held by women, which means, in the first premise, the assumption is that as a woman you do not know what the industry is about." Well aware of this, Dlongolo says she makes it her business to be extremely well informed, not just about the legal and technical aspects of mining but also the broader political and economic context in which it operates. "To see the change that we desire for our nation, it's no use sitting back and watching, by not getting involved in the debates. You can't be effective unless you are willing to understand the burning issues from all perspectives, to participate in the debates and be an active citizen," she says. "The best advice I could give a young woman thinking about coming into this industry is this: learn as much as you can about the industry, be results and solutions oriented, and exude confidence. I always ensure that I am well researched and know what I'm talking about and where I don't know, I am not afraid to ask the right questions. When people see that, they will listen."